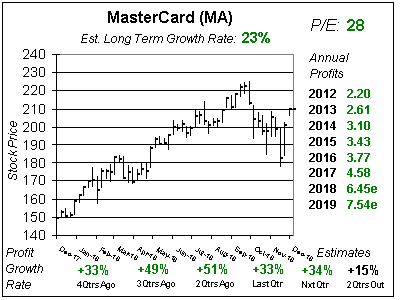 MasterCard (MA) stock is stuck in a rut even though key metrics grow at double-digit rates. 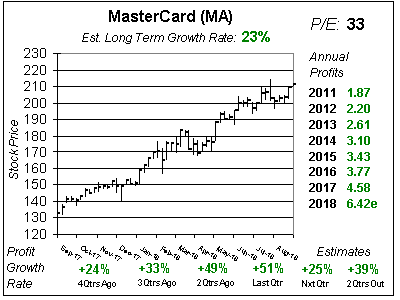 Last qtr the credit card company had -3% profit growth. When you deliver those kind of results with a P/E of 26 its going to be tough to get the stock up. But when you look deeper in the numbers, you see positives. Processed transactions grew 14% last qtr, and gross dollar volume grew 13%. MA has two problems right now. First, foreign exchange clipped revenue growth from 14% to 10%. Second, MasterCard offers up front incentives to gain new business, which hurts profits in the beginning of the deal but helps later on. Profit growth the next 4 qtrs is expected to be 6%, 5%, 4% and 14% respectively so the stock could (should) continue to hang around $95 for a while (as it has for the last year). But with an estimated long-term growth rate of 16% and solid safety, I think this stock will get back on track later in the year. For now I feel MA is fairly valued and I want to hold off on buying now and look to get in later this year. I think the stock’s in a rut and might not get out until double-digit profit growth is upon us. This stock has been overvalued for a while, thus the stagnant stock action is good as it brings the valuation down some and sets MA up for another solid move higher. Last qtr the company beat the street by 2 cents but had lowered this estimate by 13 cents in prior qtrs. In fact the company had lowered estimates by a lot to beat them by a little the prior 3 qtrs. One positive is 2016 profit estimates didn’t fall this qtr (they had the prior 3 qtrs, from around $4 to around $3.50). Qtrly Estimates stayed around the same as they were last qtr, they had also been in decline. MasterCard has an Est LTG of 16% a year in addition to a 1% dividend for an estimated total annual return of 17% per year. With its long history of growing profits each year and high level of certainty, this stock is worth 25 times earnings. The P/E is 26 right now, and with mid-single digit profit growth expected the next 3 qtrs I don’t have the urge to buy. MasterCard is a core stock holding for most investors. There’s high degrees of certainty and consistency here and that’s why many successful mutual fund managers have MA as a top holding. But right now the stock is stuck in a rut as profit growth isn’t what it should be due to the strong USD and incentives paid our for new business. MA is on my radar, and I will look to add to both growth and conservative accounts later this year.